SAN JOSE — Masahiro Nitta will give a shamisen workshop on Saturday, March 9, at 1 p.m. at the Japanese American Museum of San Jose, 535 N. 5th St. in Japantown. Presented by CATS (Contemporary Asian Theater Scene), the workshop will cover the history and tradition of Tsugaru shamisen; introduction to evolution of performance styles — the spread of shamisen in the modern world; hands-on instruction and demonstration (if you have a shamisen, bring it). Nitta was born in 1984. He began studying the shamisen in 1998 with the encouragement of his father, Hiroshi Nitta, and won the National Tsugaru Shamisen Kanagi Competition in Aomori Prefecture twice in a row in 2000 and 2001. 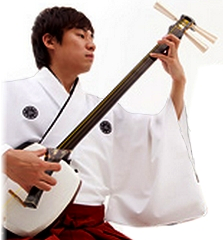 In 2002 he won the fifth All-Japan Tsugaru Shamisen Contest and participated in a Japan-Korea cultural exchange festival in Korea. In 2003, Nitta participated in the ASEAN Concert in Bangkok and performed at the World Music Concert put on by NHK to commemorate the Japan Prize. In 2004, Nitta performed at the Asian Performing Arts Festival in Vietnam and “Shadow of the Silk Road” organized by the Japan China Friendship Association, appeared in the movie “Overdrive,” and went on a tour with his father to the Philippines, Thailand and Laos, which was organized by the Japan Foundation. In 2005, Nitta was invited by the University of Pennsylvania to play a concert and lecture at the college. He also held a concert at the Kennedy Center. He has performed with guitarist Dean Magraw and saxophonist Sekpol Unsamran (Koh Mr. Saxman). He presently plays with his father in Nitta Oyako. The motif of “social bonds” runs throughout their music. Nitta is also active in The Esoragoto Band, which includes taiko drums, bass and saxophone. In addition, with an instinctive musical sensibility, he plays in sessions with musicians using a variety of folk instruments.